Billing invoices are an important part of any business, you need to create them to let your customers/clients know just how much they owe. But creating a billing invoice can be a confusing task. You want something that is professional in appearance and contains all of the necessary information, but you just don’t know how to get that. 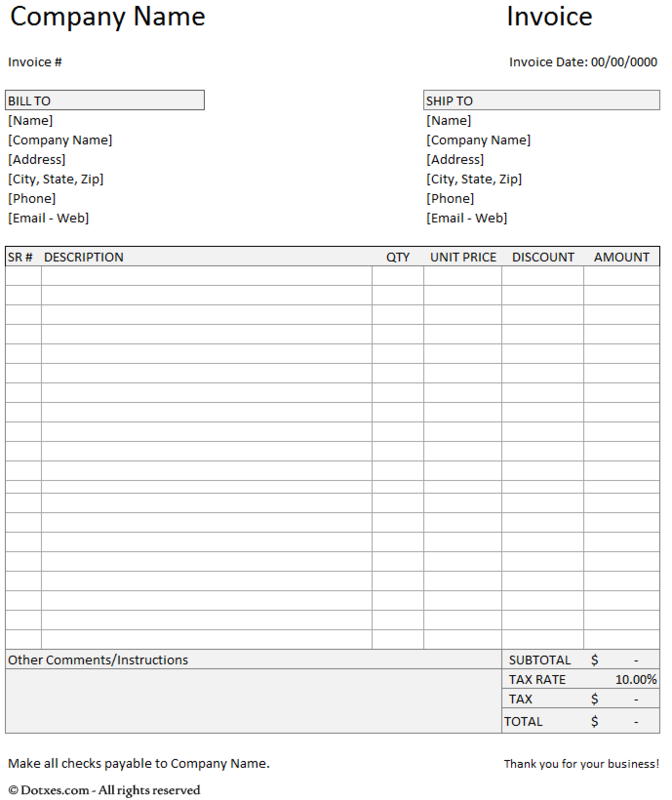 This billing invoice template is just the help that you need in getting the task done. This billing invoice template was created in order to help you create a professional bill for your clients in a way that is simple and easy to do. The template was designed with small businesses in mind, and it can easily be customized to meet your needs. This invoice template is created in a simply and user-friendly format. It is very basic in design, and it has a professional, light gray color scheme that is neat and tidy and great for printing. If you like, though, you can customize the color scheme to your needs by going to Page Layout > Themes > Colors. If you wish to edit the fonts and background colors, you can switch it all up. This invoice template is suitable for many purposes. All you need to do to use it your own way is to change the units. For example, you can change the quantity to hours, instead, and change the unit price to rate per hour. We are presenting two types of invoices here, with the first being with tax and discount – as you can see in the preview – and the second being without tax and discount so that it can be used as a basic and simple invoice. If you would like to leave a field empty, just use “0” values in that place. Do not use the delete button to clear a column, as that could cause errors, such as deleting the applied formula. Also, do not use +, -, /, *, or any other sign, as that might ruin your hope of getting a perfect total amount. Always check the formulas of subtotal, tax, and total after you add or remove any row on the template. Always make sure the payable company name is correct, as it will be automatically updated. When you are sending your template out, always do that via a PDF or printed copy. You don’t want to use an editable program when sending your invoice. When you are finished with the billing process, you can turn the billing invoice into a receipt by simply making a few changes in the wording. Always be sure to fully include all of the information that might be needed by your customer or client.